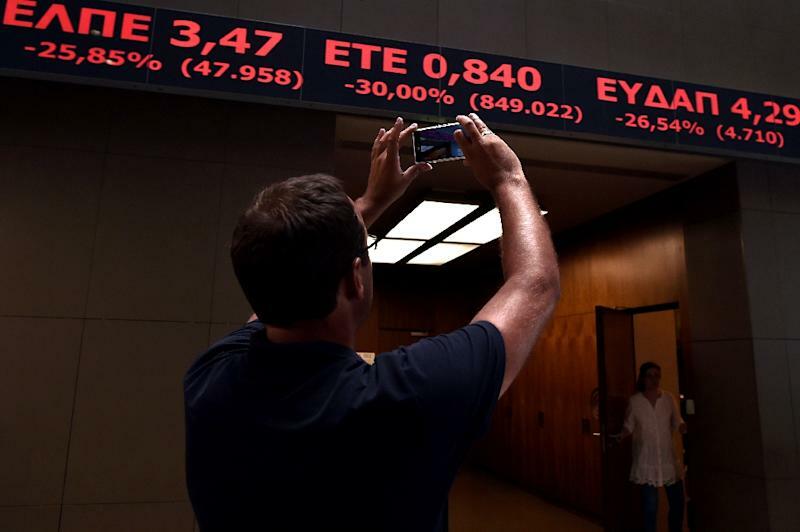 Athens (AFP) - Greek stocks tumbled on Monday to close nearly eight percent lower, with bank shares losing almost a quarter of their market value amid concerns over the future of government reforms. The general index on the Athens stock exchange closed down 7.9 percent at 464.23 points -- a 25-year-low -- while banks suffered a 24.3-percent average drop. Top companies such as the Public Power Corporation, the Piraeus Port Authority and prominent construction firms lost between four and and 12.5 percent. But in Greece investors had additional reasons to head for the exits, with the government seen to be facing an impossible choice between further austerity and social unrest. The Athens stock exchange had already lost 9 percent of its value last week, with the banking index taking a beating with a drop of over 24 percent. The main banks had gained a little ground after receiving a recapitalisation boost in December, six months after a disastrous tug-of-war between the leftist government of Prime Minister Alexis Tsipras and Greece's EU-IMF creditors forced the imposition of capital controls and nearly wiped out the value of their shares. Greece last week wrapped the first phase of a fiscal review by its EU-IMF international creditors, with no agreement in sight on a controversial pension reform that has caused a social backlash against Tsipras' fragile coalition. German business daily Handelsblatt over the weekend cited a source close to the talks saying that "Greece was doing a lot on paper" but less on the application front. Leftist daily Avgi, which is close to the government, on Sunday said there were "many and significant" difficulties in reaching an agreement on Greece's fiscal targets for 2017 and 2018. These include a gap of 800 million euros ($872 million) and disagreements over how to handle the mountain of bad loans weighing down Greek banks. Protests are mounting against Tsipras's government -- which aims to slash maximum pensions -- with a general strike held last week and farmers intermittently blocking national highways and border crossings for the past three weeks. The prime minister has a majority of just 153 deputies in the 300-seat parliament with which to secure passage of the pension bill later this month. But the government has repeatedly dismissed talk of early elections, noting that the last ballot was only held in September.